Mountain View, Calif. – March 25, 2014 – Speck, the leading designer of award-winning, mighty slim protective cases and covers for smartphones, tablets and laptops, announced its lineup for the new HTC One® (M8), which was revealed earlier today. 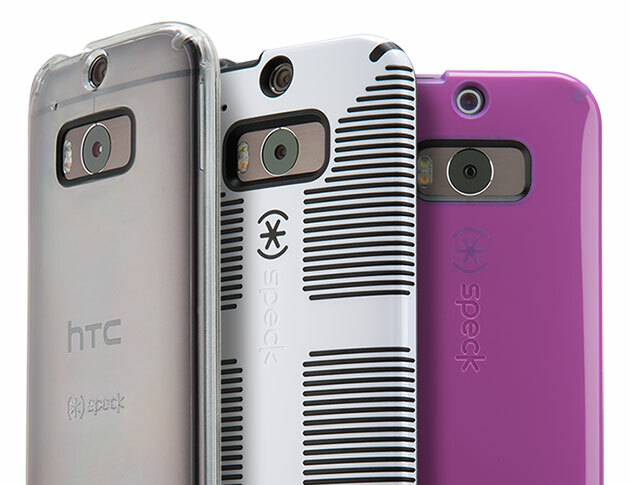 Speck is releasing three of its most popular case designs, expertly engineered specifically for the new HTC One (M8). Each case combines style with mighty slim protection in a sleek case. Additionally, our standard anti-glare ring around the camera, which is included on all Speck CandyShell designs, works especially well with the device’s new duo camera and its powerful flash. CandyShell for the new HTC One (M8) ($34.95) is a sleek dual-layer case that features a hard outer shell to guard against impact and a soft, rubbery interior to absorb shock from bumps and drops. CandyShell also features a raised edge to protect the screen and rubberized button covers for defensive details. CandyShell Grip for the new HTC One (M8) ($34.95) is the ideal case for texting and gaming, giving users a secure hold with extra grip. It has the same multi-impact, dual-layer protection as the classic CandyShell and features raised rubber ridges to add a no-slip grip that frequent texters love. GemShell for the new HTC One (M8) ($29.95) is a sleek, crystal-clear case for people who want slim-fit, polished protection but don’t want to cover up their beautiful new device. Extra detailed defense is provided by a raised bezel for screen protection while rubberized covers shield buttons. CandyShell and CandyShell Grip cases will be available in black, white, and an exciting new shade of purple based on 2014’s Pantone color of the year. You can find Speck’s take on this year’s highest trending and most popular color, Beaming Orchid, on some of our newest cases this Spring on speckproducts.com.